Grace Kelly: Style Icon opens this week at the V&A in London. I wish we could be there as I’m sure it will be a spectacle worth taking in. Looking through some of the articles posted across the internet, I ran across the photo above at The Errant Aesthete’s on-line salon and thought what a lot it had to teach us. Price Rainier displays perfect sartorial pitch with his daytime attire for his civil ceremony. We should take note. Until six pm, when it is permissible to wear black tie or white tie and tails, a dark suit is the best choice for your wedding. It seems strange to say, but we don’t change our clothes for many occasions. Our goal is to be well-dressed at all times and if your suits are elegantly cut, you will always be appropriately dressed. For a festive event, you may choose to wear a flower through your buttonhole, a French (double) cuffed shirt and a shinier tie, but the basic “uniform” of suit, shirt and tie remains unchanged. The focus is always on the lovely bride (for all brides are lovely, it’s true). The exceptions to this idea would be the full dress ceremony, like the church wedding that followed the royal couple’s civil service (it is standard practice in Europe to have both) for which a dress uniform or white tie and tails with ribbons may be the order of the day, or a beach wedding when blazers and white flannels or Nantucket reds would be festively appropriate. Mrs. E. and I were married on New Year’s Eve making black tie a suitable choice. It was after six, after all. This entry was posted in Elegantology and tagged Elegantology, Grace Kelly, Nantucket reds, Prince Rainer, The Errant Aesthete, V&A, wedding attire. Bookmark the permalink. What a lovely picture of the two of them! 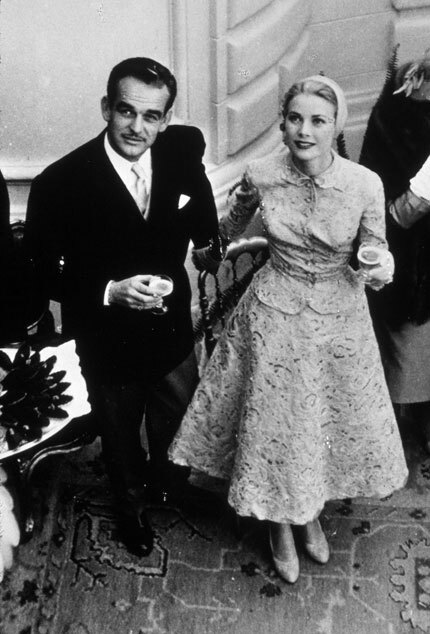 As a big fan of Princess Grace’s style, I have grown an appreciation over the years for Prince Rainier’s as well, which for the most part is overlooked. Mostly classic and conservative (my preference) but always appropriate for the occasion. You would assume being a royal, you would be schooled in appropriate attire for all occasions but it is not always the case. As always a pleasure to visit with you, hope you have a wonderful day! Great, great post. Thank you for the enormous compliment of including me in your prestigious list. It has been reciprocated. Now, what about the morning coat? I love them. Do think it’s irksome when black tie is donned too early in the day. Is that a good choice of words? Just for the record, I think Grace looks beautiful, but she always did. Ms Jett, you are most welcome. I’m enjoying your site. I love the morning coat, especially worn with a colourful four-in-hand tie for a church affair. But most men hire them and the fit looks it. I think that a perfectly fitted suit will look more elegant. That said, if you can find a vintage cutaway and have it tailored…! Ms Lemontree, you’re playing my song! Poignant post that pairs beautifully with that awesome photograph. Grace Kelly has always been a style icon of mine and the Prince, well, as I have a thing for May-December romances, he would’ve been a dream for little ol’ me. I had a prof in college that was the spitting image of Prince Rainier and I made sure to never miss a lecture! I could not be happier or more honored that you added your sartorial wisdom to this most exquisite of photographs. It is simply beautiful in dress, pose and attitude. The angle, shot from above, catching them in what appears a moment of expectancy is enchanting. So full of promise. Grace, as always is stunning, but her prince, captured here as he is, does look dashing indeed. Ms. Giramonti, I have friends who subscribe who are saving me this issue as they tell me it is crammed with inspirational articles. I can’t wait. Thanks for the link! EA, When you know enough to steal the very best… I’m glad you spotted this one and gave me the nudge with your post! Jessica, a fine romance, no? Beautiful people, beautiful places, and unlike today’s “beautiful people,” genuinely beautiful on the inside as well. And not a botox or silicone injection on either one of them. Contrast this photo with one of Branjolina: the shacking up, dragging around their kids in front of the cameras all day . . . his facial hair and dirty clothes, tatooes all over her . . . well, this photo is really refreshing! Elegance begins on the inside–it’s the whole person.